Dr. Patrick Rooney was the executive director of the Center on Philanthropy at Indiana University (now the Lilly Family Philanthropy Center) during the partnership between the academic philanthropy centers at Arizona State University, Indiana University, and Grand Valley State University. Dr. Rooney is an economist and researcher who is deeply engaged in documenting and understanding the scope and scale of philanthropy. His national perspective as an academic and a practitioner, and his experience in working with Michigan philanthropists, informs his reflections on Michigan’s history. Dr. Patrick Rooney talks about his career in philanthropy. Dr. Patrick Rooney talks about Michigan's initial interactions with the Lilly Family School of Philanthropy at Indiana University. Dr. Patrick Rooney talks about philanthropic leaders being flexible in their goals for the field depending on the nature of their funding. Dr. Patrick Rooney talks about the many functions of academic centers on philanthropy. Dr. Patrick Rooney talks about the value of trust in relationships. Dr. Patrick Rooney talks about the spirit of cooperation that has helped build the field of philanthropy. Dr. Patrick Rooney talks about developing partnerships among the philanthropy centers in the Arizona-Indiana-Michigan (AIM) Alliance. Dr. Patrick Rooney talks about the impact of Learning to Give. 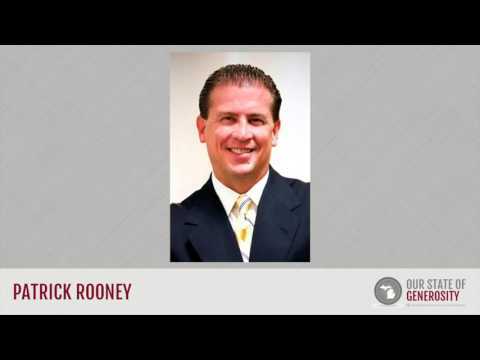 Dr. Patrick Rooney earned his bachelor’s, master’s, and doctorate degrees in economics from the University of Notre Dame. Dr. Rooney cites his introduction to philanthropy as watching his parents model the importance of tithing in the Catholic Church at an early age. He learned that it was important to make an effort to help others, regardless of how much you had to give. While working as an assistant to the chancellor of Indiana University – Purdue University Indianapolis (IUPUI), Dr. Rooney was tasked with conducting a cost benefit analysis of the Indiana University Foundation and IUPUI’s development programs. Dr. Rooney developed a systematic approach to analyzing and tracking the cost benefit analysis for fundraising organizations, which was later published in a philanthropic journal (1). The journal article caught the eye of Dr. Eugene Tempel, then executive director of the Center on Philanthropy, who recruited Dr. Rooney to begin working on more philanthropic-specific research projects. He eventually moved to a full-time position, serving as the chief operating officer and director of research for the center from 1999 to 2008. During his time, he helped transform the center into a premier research organization, directing such research projects as the Center on Philanthropy Panel Study in collaboration with the University of Michigan — the largest and most accurate study of charitable giving over time ever conducted — and the ongoing Giving USA report (2). Dr. Rooney was the director of the Center on Philanthropy during the partnership between the academic centers on philanthropy at Arizona State University, Indiana University, and Grand Valley State University. This unprecedented partnership between three of the nation’s leading academic centers for the study of philanthropy, called the A.I.M. Alliance, sought to model collaboration and explore common research standards while increasing sector capacity and diversity. Dr. Rooney lent his extensive knowledge of research and economics as a professor of economics and philanthropic studies at IUPUI for both graduate and undergraduate courses. He played a critical role in helping transition the organization from the Center on Philanthropy to the Indiana University Lilly Family School of Philanthropy. He currently serves as the associate dean for Academic Affairs and Research at the Lilly Family School of Philanthropy, which is headquartered at IUPUI. Dr. Rooney has served on multiple advisory committees, including for the Corporation for National and Community Service, the U.S. Bureau of the Census’ Current Population Survey, Association of Fundraising Professionals, the United Way of Central Indiana, and Independent Sector. He has also served as a board member for the Rollins College Philanthropy and Nonprofit Leadership Center, the Children’s Bureau of Indianapolis, the Better Business Bureau Wise Giving Alliance, and the Techpoint Foundation. Dr. Rooney was interviewed regarding his insights and experiences in working with Michigan’s philanthropic community and the Our State of Generosity (OSoG) partners. The following are selected quotations from her interview specifically related to the five organizing themes of the OSoG project. (1) Rooney, P. (1999). A Better Methodology for Analyzing the Costs and Benefits of Fund Raising at Universities. Nonprofit Management and Leadership, 10(1), 39-56.